Francis has a deliciously spicy and sweet taste. The flesh has fibers but is very soft and juicy. Francis is Bright yellow in color with green overtones and flaunts an elongated and sigmoid S-shape. Owing to the fibrous flesh, Francis may not be a popular choice for salads, but it finds great use in chutneys due to its tangy flavor. 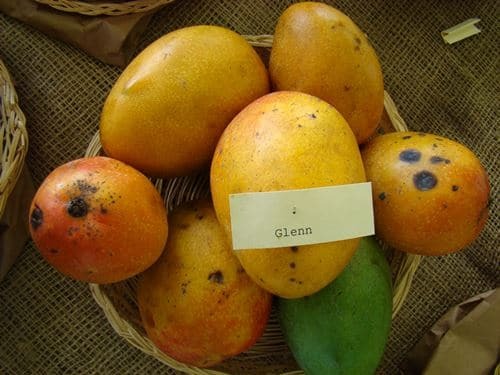 Glenn is an excellent choice among various varieties of mango. 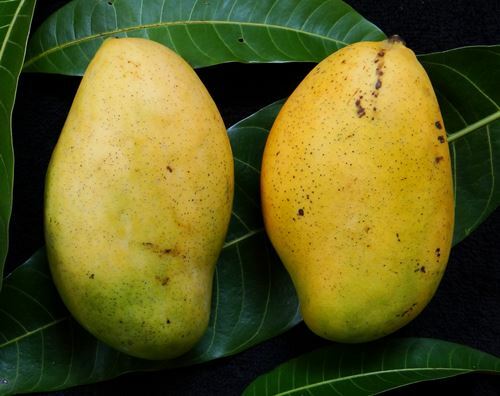 It has a sweet, silky and peachy flavor and an exotic odor which make it popular among mango lovers. Glenn mangoes are a little red or pink in color and oval to oblong in shape. The Kent mangos feature a sweet and delicious taste which is further enhanced by their juicy flesh which has a limited number of fibers. Due to their texture and flavor, Kent mangos are ideal for juicing and drying and also find uses in baking (they make for a great mango bread recipe!). Kent mangos are dark green having a dark red blush over a small portion of the fruit. The fruit itself is large and oval in shape. also known as “Dessert Mango” owing to its great use in desserts. This variety features varying colors from light green to orange to slightly yellow. Madame Francique is known for its rich, sweet and spicy taste which is rare and tangy but exceptionally brilliant. The vibrant yellow Ataulfo with a sweet and creamy flavor is every mango lover’s absolute favorite. Ataulfo has smooth, firm flesh with no fibers making it easier to use in salads or just consume on its own. 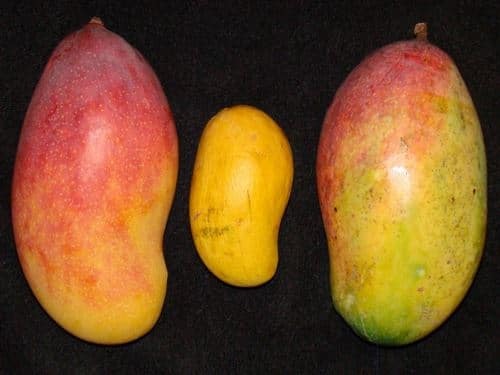 This kind of mango is small and oval in shape. They have a mildly sweet flavor with firm, stringy and fibrous flesh. Tommy Atkins have different shades going on their medium to large oval bodies. The most prominent of them is the dark red blush which covers most of the fruit. A child variety originating from Haden mangos, the Valencia Pride also finds its roots in Florida. First reported Valencia Pride fruit was produced in 1941. This variety is large and the skin is covered with a large red blush while some yellow hues also find their way around it. Valencia Pride is a fibreless variety and has a smooth, melting, juicy texture along with a mouthwatering odor which makes it a premium choice. It is enjoyed both when fully ripe and green and also as pickles when not fully grown. Keitt mangos have a sweet and fruity flavor with firm, juicy flesh having only a limited amount of fibers. Keitt mangos are dark to medium green often with a pink blush over a small portion of the mango. The keitt mangos are vast and oval in shape. I am living in Tanzania and my best fruit is mango. We have mango fruit on our market that they say comes from Kenya. It is very sweet it melts in the mouth and has no fibers. On the picture looks like Tommy Atkins but description does not fit. It is Glenn? description fits but not the coloring. Where can i get the grafted mango trees? Please, help!! !